The year 2001 was an annus horribilis for soccer in Africa. Within the space of one month the continent saw deaths at matches in Ivory Coast, South Africa and The Democratic Republic of Congo. Practically anywhere in Africa a mixture of rowdy behavior and poor crowd control had made attending a match a risky business. In May of that year fierce rivals Asante Kotoko and Hearts of Oak met at the Accra Sports Stadium in Ghana’s capital. The crowd was raucous and every adverse refereeing decision was booed, while the players themselves seemed to be letting the occasion go to their heads as several meaty challenges flew in. For most of the game Kotoko fans were the happiest as their team led 1-0. Things started to turn ugly after a contentious equalizer and further fuel was added to the flames when Hearts took the lead. The Kotoko fans did not like what they saw and started ripping up the stands, using plastic seats as missiles against the police and rival supporters. The police in turn used tear gas, the most powerful weapon available to them short of live ammunition. Tear gas is the bluntest of instruments when used against crowds. Designed to blind and disorientate, it is only really effective if the crowd has somewhere to run to. Many of the fans tried to flee the stadium only to find their path blocked by locked metal gates. In the ensuing crush more than 100 died through compressive asphyxiation and hundreds more were injured. To compound the unfolding tragedy, only a handful of medical staff were on duty that evening and even these had departed the scene before the trouble flared. 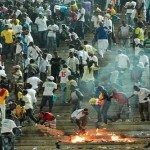 What was the Accra Sports Stadium Stampede death toll: Official figures put the death toll at 127. You should know: The coroner’s inquiry was hindered by the fact that many of the dead were Muslims, it is the custom in Islam that a burial should take place within 24 hours of death and this prevented detailed forensic examination. Even the official death toll may be a gross underestimate as many families took away their loved ones’ bodies to give them a decent burial in accordance with their beliefs.